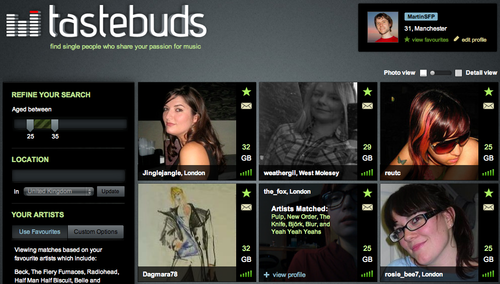 Tastebuds.fm is a brand new music dating website that matches potential partners based primarily on their tastes in music. It integrates directly with popular Internet music radio site Last.fm, allowing users to plug in their username and immediately populate their profile. There’s also the option to manually input your favourite bands when searching for matches. The site is the brainchild of Julian Keenaghan, web developer at popular London events site Spoonfed.co.uk, and Alex Parish, previously technical director at Spook Media, Edelman's digital department, before leaving to focus on Tastebuds.fm.